In at #81 is the eternally under-rated Dave Cockrum with Uncanny #149. I love all the little details in this one as well as the overall image. I like the crazy colorful costume Kitty is wearing (roller skates and leggings!). There for a while she was changing costume designs multiple times an issue. It was a nice touch by writer Chris Claremont. Something honest and real for a young teen girl to experiment with tons of designs for her “uniform”. Unforgettable. I think nearly all teen/almost-teen boys reading back then were in love with Kitty Pryde. I know I was! The perspective on this piece is nice as well with the group centered at the bottom and the menacing face looming large over and behind. The artists signatures illuminated in Wolverine’s flashlight beam is another great touch. Fantastic! Check back here tomorrow night for more in my count-down of Top 100 favorite comic book covers. This is an OK cover, and an OK issue that felt a bit like filler. But Kitty’s costume was gloriously hideous. I do love the background on this cover! 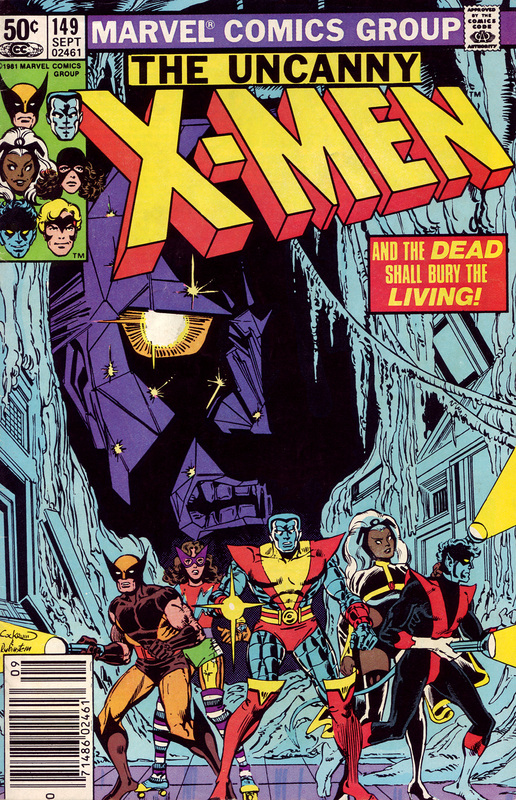 But the X-Men with a light torch… It’s a little bit annoying and the Kitty’s costume make me puke. I had completely forgotten this cover and I’m glad to discover it again. Well the costume is supposed to be awful….this was a phase where she was changing her costume 2-3 times an issue -which is probably a very realistic (and funny) thing a young girl would likely do in the situation.